I have the habit of not visiting famous monuments of each countries I have traveled. I prefer to do things where I can see the activities and daily life of the locals. 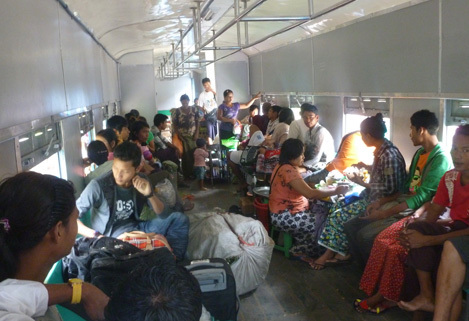 While in Yangon, I’ve heard many people talking about the Yangon circular train ride that lasted around 3-4 hours. From what I’ve gathered, the ride is a bumpy one and far from luxurious, even if you pay for the first class coach which cost USD1.00! So on the morning that I checked out from my hotel, the friendly hotel front desk dude asked me what I would do today. I proudly told him that I will take the Yangon circular train ride, hoping to get his approval. I was thinking to myself that he would probably label me as a cool tourist for doing something different from regular tourist, but instead his reaction wasn’t what I expected. I then asked him, is it going to be fun and exciting? His answer wasn’t really encouraging and sounded like a season politician of trying not to give a definite answer. That’s not very encouraging. I hopped on to a taxi and told the driver that I would like to go to the train station. The taxi was really friendly and chatty at 7.30am in the morning. 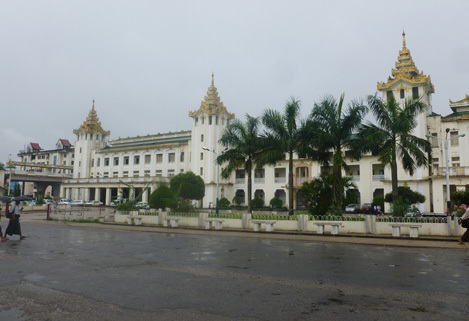 He asked me if I am going out of Yangon and I quickly replied to him, PROUDLY, that I will take the circular train ride. Still hoping for a positive respond, the taxi driver just chuckled. I asked him if the ride is fun and he just gave a clear answer – NO! I am not going to back out from my plan and I decided to just follow my heart. I bid him “Mingalapar” and went straight in to the train station looking to purchase my ticket. I crossed an overhead bridge and went to the ticket booth to purchase my ticket. The ticket seller told me that the train would arrive at 8.20am. The time was only 7.55am and I just sat down at one of the seating provided by the station and just observed my surroundings. 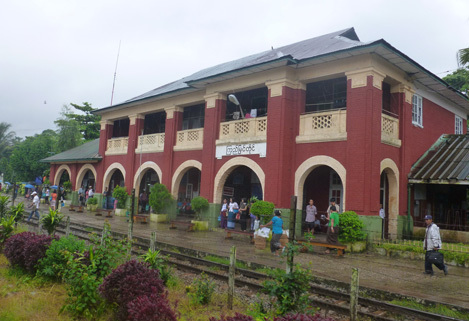 The train station is really old and there are quite a number of Burmese people waiting for their train ride as well. A train was approaching at 8.10am and I am not sure if that’s my train. The ticket seller came out of his booth and told me that that’s my ride. I climbed up the stairs of the coach and took my seat among the locals. 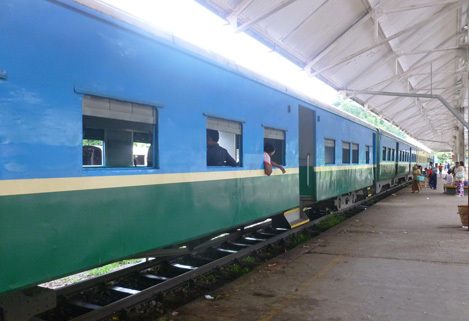 Once everybody was on board, the train started to move really slowly, almost like walking pace. I have no idea how this experience would turn out but that’s the thing that have always attracted me – the unexpected. The first one hour, I was paying a lot of attention looking out of the window trying to catch glimpses of beautiful sceneries. After looking out of the window for one hour and taking pictures, I was starting to feel a little bit hungry. 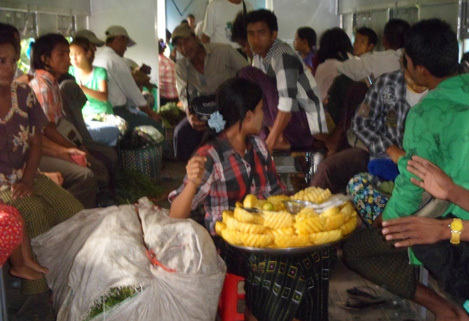 There’s a lot of vendors coming up and down offering food, betelnut, fruits, tea, cigarettes and small handicrafts to the passengers. A young Burmese dude in his longyi caught me looking at him eating some sort of salad and he made a gesture of offering me some. I just smiled and he proceed to make a thumb up sign. I saw him buying the salad from a lady vendor just minutes ago who was just 2 meters away from me. So I decided to buy and all the passengers near me was suddenly putting their attention on me. I have expected this kind of reaction as the locals normally feel really good if a foreigner are willing to try their local delicacies. Some market next to the tracks. I could feel that a lot of eyes were gazing on me anticipating my first bite and reaction. In situation like this, whether the food is good or bad, I would normally make some gesture to show my sign of approval. Everybody was pleased with my reaction and I personally think the food did taste all right. 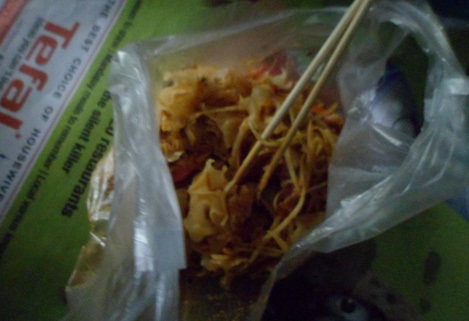 It is some sort of mushroom salad with some dried shrimp, fried shallots, chili powder and sort some of thinly sliced vegetables or fruits which I can’t really make out off. The ride began to be more fun when the locals started to interact with me. The guy who sat next to me attempted to speak to me in his limited English. Even though his English is not at basic conversational level, I could understand most of the things he tried to tell me by looking at his body language. He was with a big group of friends who are mostly in their late teens. Everybody was teasing him for trying to speak in English. He retaliated at the group by pointing at a girl and uttered the words, “head no good” while making the sign of a crazy person by making small circling motion with his index finger pointing to his head. The girl stood up and started hitting him on his back with a mixed of happy and angry emotion at the same time. I enjoyed watching that as I believed the guy was taking this opportunity to flirt with the girl – genius! I can almost swore that he enjoyed getting hit by the girl – at least some body contacts with a different gender. Nothing much happened after that as we can’t really converse much other than jesting around with simple English and body language. 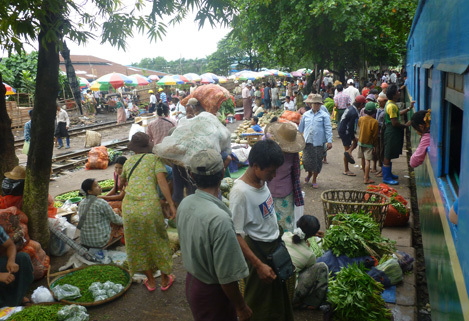 Everybody just went about doing their own stuff, some were listening to music, some continued to talk to their friends, some smoked, some chewed more betelnut and some were even tying up the vegetables which I believed ready to be delivered to some market in Yangon. 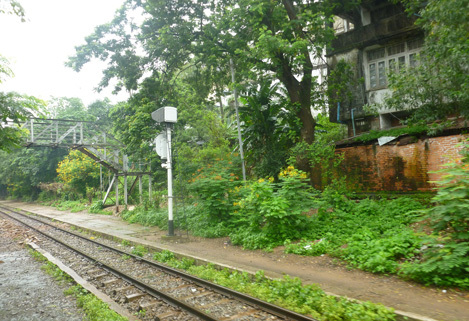 As the 3 hours passed quickly, the train was approaching at the spot where my ride began. I am glad that I’ve never been guilty of spending too much time on smartphone or tablet while traveling, even on short MRT rides. I have always prefer to observe my surroundings while taking rides or waiting to board my plane in airports. I believe this makes me a more sensitive and an observant person. The highlight of the ride is not the beautiful sceneries as it look almost the same in the entire duration. The highlight is definitely the friendly Burmese people who made the effort to interact with me. With Myanmar slowly opening up to the whole world, I am not sure how long this kind of things would last. 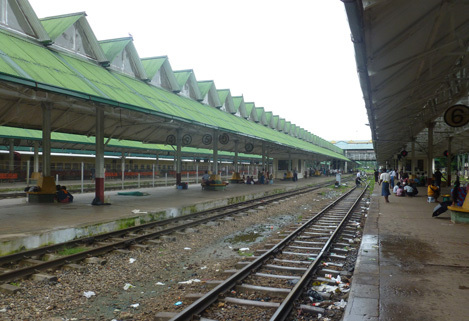 I am just happy to be able to experience the innocence of the locals and went all the way with my decision to try the Yangon circular train ride despite the not so favorable reaction from my front desk hotel staff and taxi driver.